Every so often, we are sent products from different companies. I was lucky enough to be accepted by M Squared Brands. 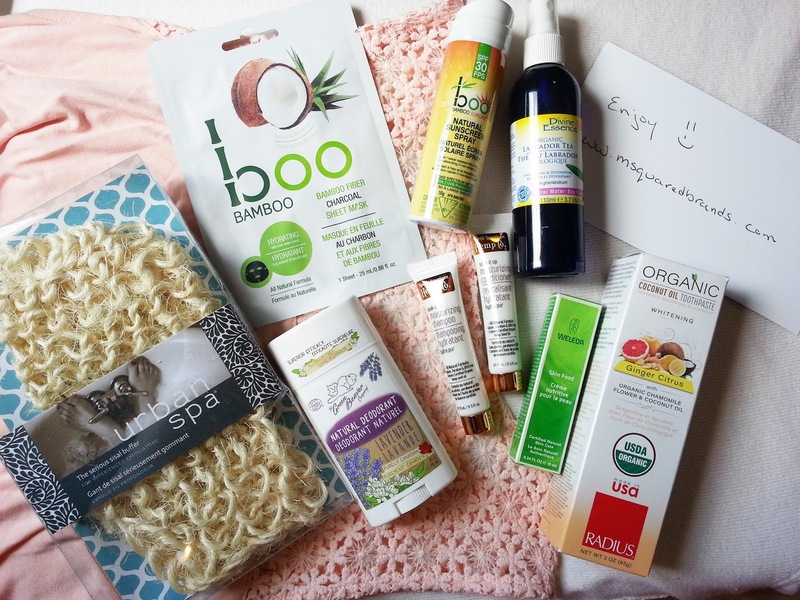 They send out seasonal blogger boxes, with their main focus being on natural and organic products, made by Canadian companies! This box is the Summer edition! 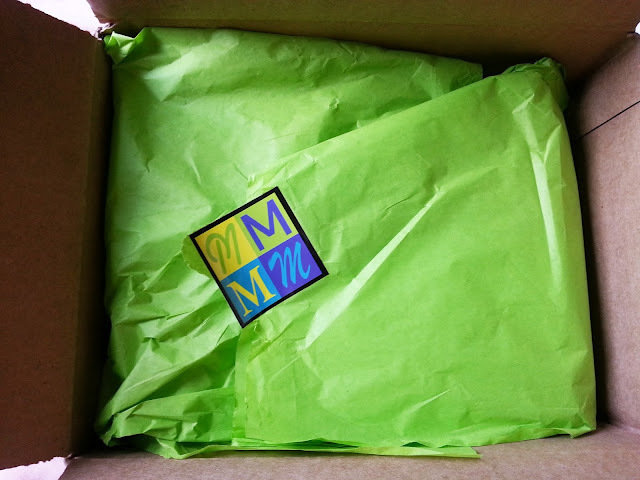 As always, the products come wrapped in bright tissue paper, with their logo. Definitely sure to brighten your day! If you love the way body buffing makes your skin look and feel, this little mitt will rub you just the right way. Strong, durable and stretchy when wet, the wide sisal weave provides maximum exfoliation and improves circulation. I haven't tried this out in the shower yet, but it feels very rough while it is dry. Hopefully it softens just a little once it gets wet! You can purchase it here. Boo Bamboo's natural 100% bamboo fibre charcoal Sheet Mask is enriched with Coconut, Aloe, and Bamboo extracts which join forces to protect, soften, detoxify and moisturize your skin while leaving it with a soft radiant glow. I love sheet masks! This one is a black mask instead of the typical white sheet. It is very hydrating and feels great on the skin. It wasn't too saturated, but I was able to wear it for over 30 minutes. I really enjoyed this one! It can be purchased here. Boo Bamboo Natural Sunscreen Spray with Bamboo Extract provides you with natural Broad Spectrum UVA/UVB protection. Directions: Apply generously 15 to 30 minutes prior to exposure to the sun. Reapply as needed or after swimming, towel drying, perspiring heavily, washing and vigorous activity. I could have used this a few weeks ago! I ended up with a sunburn on my shoulders, and was it ever painful! This is also the perfect size that you can put into your purse, great for on the go. It can be purchased here. These by-products of steam distillation of essential oils are treasures in themselves! Divine Essence uses a low temperature extraction method, which provides the floral waters with the equivalent of 1% of rich active ingredients. The properties of the waters are similar to the extracted essential oil. With their fresh and delicate scent, they are excellent skin toners for the face and body. I love face mists! This is nice and refreshing! This specific floral water is not on Well.ca, but there is a rose water and a witch hazel water mist available here. New and improved Green Beaver Co. deodorant contain a revolutionary organic sage oil isolate which is effective at killing existing odour, as well as preventing body odour. Contains soothing Labrador Tea which combats irritation caused by shaving. Plus this natural deodorant stick goes on clear and offers 24 protection from odours. I've never used a natural deodorant before, but it's definitely something I'm interested in trying. I'm just finishing a stick up now, so I will give a quick little review on it once I get a chance to put it to the test. It can be purchased here. I haven't had a chance to try these out yet, but moisturizing shampoo and conditioner sounds like it's right up my alley. I've noticed my hair is a little more dry since it has been bleached. These mini sizes are perfect for travelling, but I'm sure I will be using these before I get a chance to travel! You can buy the shampoo here, and the conditioner here. Dry, rough skin of any age gets indulgent moisture with this intensively nourishing, deeply hydrating cream. It’s a unique, ultra-rich whole-body cream that deeply hydrates, restores and protects your skin. This is perfect for elbows, knees, and other rough spots you may have. It feels great on the skin, and doesn't take long to soak in either. You can purchase it here. Organic Ginger Citrus Whitening Toothpaste combines zesty, mint-free ginger, invigorating citrus, and the cleansing benefits of basking soda to offer a refreshingly simple, low-foam toothpaste that is both safe and effective. I'm not big on toothpastes that are not mint in some sort of way, so I haven't tried this yet. However, once the toothpaste I'm using now is finished, I will be giving this a shot. I also have never tried a coconut oil based toothpaste either, so this will all be new to me! I will give a quick little review on this in a Five on Friday post to keep you updated! You can purchase it here. Overall, this is a great blogger box that gives me the chance to try out more organic and natural products. There are a few brands in here that I have never heard of, which is also great because sometimes you find a holy grail product that way!